Eau Claire, Wis. (Blugolds.com) -The University of Wisconsin Eau Claire women's tennis team earned a 7-2 win over Division II opponent University of Minnesota Duluth (UMD) on April 5, at the John and Fay Menards YMCA Tennis Center. 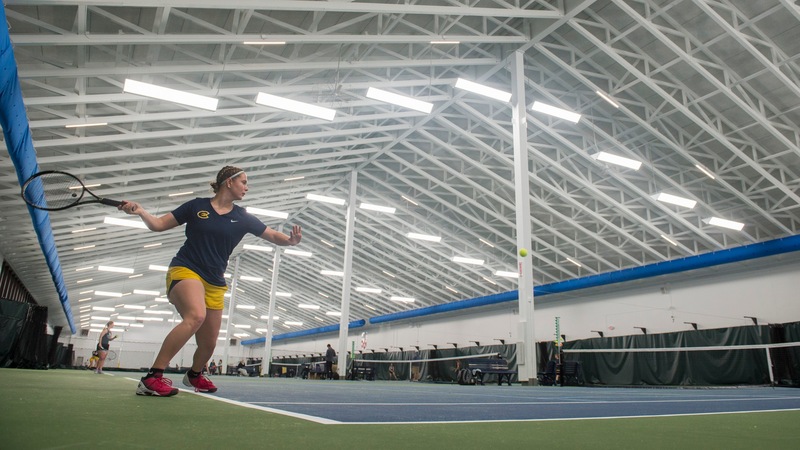 The Blugolds opened the match with strong doubles play, winning all three doubles matches. Natalie Wijesinghe (Apple Valley, Minn.) and partner Emily Cooper (White Bear, Minn.) earned an 8-1 victory at No. 1 doubles, while Molly Stewart (Amery, Wis. ) and Hanna Zevenbergen (Baldwin,Wis./ Baldwin-Woodville) defeated Natalie Cahill/Sophie Lynch(UMD) 8-5 at the No. 2 doubles spot. Lindsey Henderson (Prior Lake, Minn.) with partner Alexa Brooks (Beaver Dam, Wis.) finished the doubles sweep with a 8-3 win at No. 3 doubles. Heading in to singles play the UW-Eau Claire had a 3-0 lead over the UMD, and the Blugolds would never look back. Wijesinghe led the way at the No. 1 spot, winning 6-0, 6-2. Cooper had a strong match at No. 2 singles earning a 6-4, 6-2 win. Stewart made quick work of Cahill (UMD), winning 6-4, 6-2, while Henderson got a victory at the No. 4 singles slot. The Blugolds with the win improve to 11-4 overall, they will return to action on Sunday April 14, against St. Scholastica.